This year will be crucial for the future of United Kingdom’s relationship with the European Union following Brexit. The next round of negotiation talks will take place between February and March, and will focus on defining a two-year transition agreement. After that, the next important deadline is likely to be October by when the withdrawal agreement, that should mention the main guidelines regarding the future trade relationship, must be defined in order for the UK to formally exit the European Union on 29 March 2019. We have defined four possible scenarios explaining how we think the trade agreement could unfold. Based on the two most likely ones, we have considered the potential impact on the UK’s macroeconomy, currency, rates and equity. A December 2017 political agreement between the United Kingdom and the EU only cleared the path for two subsequent negotiations on a transition period and on the future trade relationship, with the latter being the most difficult topic (especially regarding financial services). The political agreement reached in December concerning the Brexit divorce terms addressed three difficult issues in particular. First, the rights of expat nationals on both sides, second, the UK’s exit payment, and third, the question of the Irish border. While real convergence was reached on the first two issues, the third was more buried under vague language than resolved, and may only be fully agreed on when the final trade relationship is known. As this agreement has cleared the path for the negotiation of a transition period that could last nearly two years (from March 2019 to December 2020), the risk of a “Hard Brexit” (exit without a deal) in March 2019 has declined. However, divergences concerning the transition period will have to be bridged and, more critically, the major topic of the future trade framework (especially regarding financial services) is still to be addressed. Theresa May’s position in Parliament is weak and the Conservative party obviously remains very divided over the Brexit issue. After a pause at the end of last year, pressure on Theresa May from the pro-Brexit camp has just increased again, with media reports of a potential rebellion. Pro- Brexit Conservatives indeed consider May’s stance to be both too soft on the transition period and (based in particular on views made public by some of May’s close allies) too likely to leave the UK in a constraining trade framework with the EU where the country would not gain enough new freedom. The tentative timetable is shown below. It must be noted that this timetable seems very tight for the negotiation of the future trade relationship. The Withdrawal agreement should, in principle, mention the future trade agreement but, given the time that is generally required to conclude complex international free trade deals (usually several years), it is difficult. Regarding the transition period arrangement, the EU’s position is that the UK should continue to comply with its former EU obligations, while not participating in decision-making bodies. The UK will probably try to retain a voice in some decision-making processes and obtain a number of exemptions from its current obligations (including possibly on immigration) and changes to EU rules that could take place during the transition period. These diverging views, however, can probably be bridged. 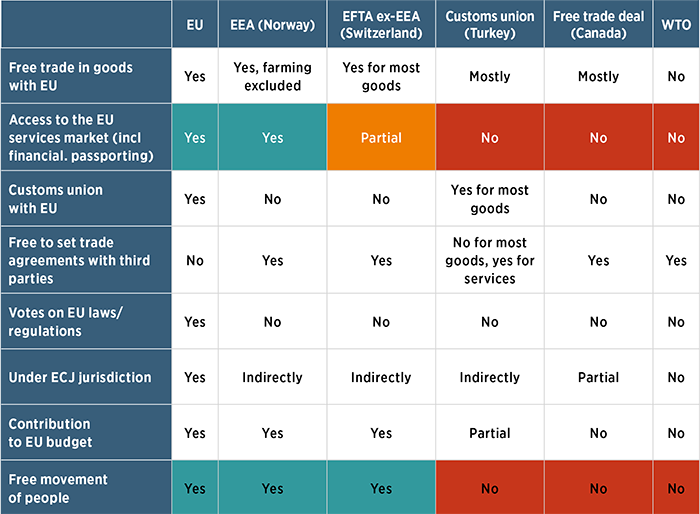 Regarding the future trade deal, EU and UK positions look far apart, at least initially. Crucial for the EU, at this stage, is that the UK should not be allowed to cherry-pick elements of the single market. The EU has free trade agreements with a number of other countries that do not participate in the single market, but Michel Barnier insisted in December 2017 that such deals, which are primarily for goods, have no vocation to cover financial services. The implication is that for the UK to retain full passporting for financial services (Norway/EEA model) or even access based on a number of sectoral agreements (Switzerland/EFTA model), it would have to accept freedom of movement for people, payments into the European budget and (at least) indirect ECJ jurisdiction. As has been commented on many times, the EU’s goal is to prevent a situation where the UK be rewarded for Brexit by obtaining a better deal than it had as an EU member (similar market access and less obligations). At the same time, a number of individual EU countries do hope to bring within their borders activities currently conducted in the UK, while for others maintaining free movement of people (and/or access to the UK market for their goods) is key. While EU countries showed a united front in prior negotiations, divisions are more likely to appear on these issues in future talks. The UK has not officially stated its position and current government weakness is not helping to define it. However, the UK will try to retain maximum market access, including by trying to have the EU recognise the “equivalence” of British goods and services regulation, which would however be allowed to deviate from EU regulation over time. Conversely, the UK will (at least initially) try to yield as little as possible on free movement of people, ECJ jurisdiction and contributions into the EU budget. However, it must be noted that while rejection of these was a key motivation of the Brexit vote in June 2016, they are certainly not unacceptable to most Conservative MPs (nor by the Bremainer majority in Parliament). 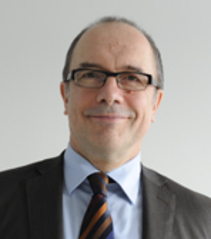 Bremaineers and Brexiter within the Conservative Party are also at odds on whether the UK should ask to remain in the EU customs union (which would imply that the UK cannot sign trade deals with other parties, although intermediate solutions, such as the EU-Turkey partial customs union) do exist). Taking into account these factors, and potential political events in the UK until a final trade deal can be concluded, many scenarios are possible. We can however list four types of ‘broad’ scenarios for the ffuture trade relationship. 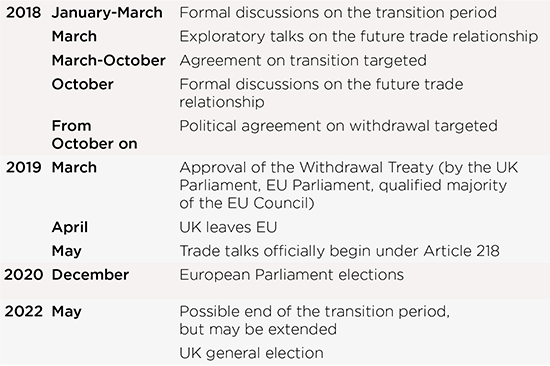 It is to be noted that these are scenarios for the final deal, whose broad lines should, in principle, be known by October 2018, although there is a possibility that uncertainty extends beyond that horizon and that the key elements of the future trade relationship can only be agreed upon during the transition period. A quasi-EEA relationship (soft Brexit), with access to the single market (only with few exceptions, including some in financial services) and only minor restrictions on movement of people. 25% probability. This scenario would be the most positive for the UK economy, but could meet opposition from Brexiteers arguing that it has given the UK almost no additional flexibility in comparison to EU membership (except the right to sign trade deals with third parties, if the UK exits the EU customs union), basically forcing the UK to keep or adopt single market norms and standards while depriving it of its voice in decision-making bodies (the Norway situation). It could also be difficult for the EU to accept extensive free trade with the UK in financial services if there is any restriction in free movement of people. An intermediate relationship, with free trade in goods and a number of sectoral agreements for passporting services (with less access to the EU market of financial services than what Switzerland enjoys). 50% probability. This limited access is the price the UK would pay for imposing major restrictions on movement of people and paying only limited contributions to the EU budget (possibly on a cash for access basis, as recently suggested) This scenario, while not in the UK’s short- and medium-term economic interest, would satisfy Brexiteers while not generating a “moral hazard”’ (incentive for other countries to leave) on the EU side. It is, however, likely to meet opposition from both the mostly Bremainer Parliament and business lobbies. A hard Brexit (on WTO terms with very little or no passporting of financial services). 15% probability. Caused by a failure to find any agreement, this scenario would trigger a serious shock to the UK economy, and would also, to a much lesser extent, negatively impact the Eurozone economy. In our view, a precondition for this to happen would be early elections in the UK and Labour victory (or a coalition led by Labour, possibly including the SNP), followed by another referendum (currently ruled out by Labour, though), before May 2019 (after which the UK will have left the EU). Note, however, that there is also a very remote probability that the UK could request to postpone its exit (a possibility under Article 50, provided all EU members agree) or even to withdraw its invocation of Article 50 (although the possibility to do so is legally unclear), which could make room for a Brexit reversal even later on. It is not easy to give an explicit evaluation in terms of forecasts of the different possible outcomes. However, it is clear that GBP will be a key factor in these projections. In our base case (labelled scenario 2 in the previous section), in the end there will be free trade in goods but limited passporting for services, therefore uncertainty will likely increase from H2 2018 and more so in 2019, when it becomes clear that financial services won’t be provided to Europe from the UK as before. This outcome would add downward pressure on the GBP again. A weaker pound will mean lower investment (they co-move, not in a causal relationship, but they will be both driven by rising uncertainty) and this will hit both residential and business investment. Such a slowdown will put a brake on the economy that will hover around current pace, with the weakness of pound leading to higher exports and a greater contribution of net exports to growth. In this scenario it is likely that the inflation rate will be around 3.0% in H1 2018, but will then slow down a little, hovering around 2.6% thereafter. In the case of our second most likely scenario (labelled scenario 1 in the previous section), with the UK accessing the single market for services too, uncertainty will diminish progressively and the GBP would appreciate, particularly in 2019. In this context, investments are likely to accelerate but imports will also be higher. 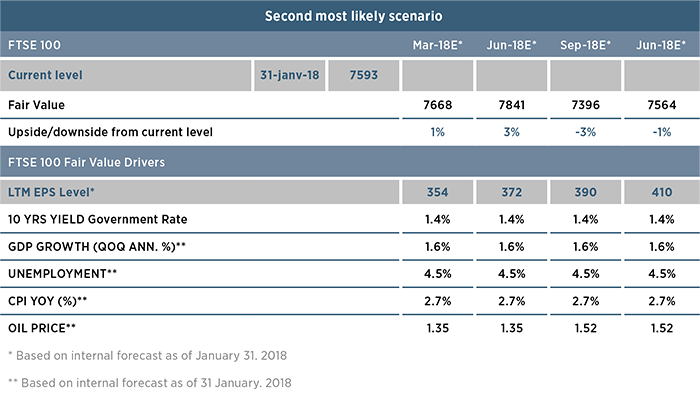 Growth is already expected to be more sustained in H2 2018 (with full-year growth of 1.8% vs. 1.6% in the base case scenario) and will be again at 2.0% in 2019. In this scenario, inflation would remain at a slightly higher level (staying at around 2.8% in H2 2018) but then fall rapidly in 2019 towards the BoE’s target (at 2.2% in Q4 2019). What trend has the pound followed so far? Politics has clearly been the main driver for the pound in the past two years. The Bank of England (BoE) perceived the increasing uncertainty surrounding Brexit as the main factor driving the fall of the currency as early as the beginning of 2016. Since the referendum, the pound has clearly fluctuated on the back of political developments, as the decision to leave the European Union implies (at least in theory) that major structural changes to the economy would be on the way. Since then, the UK has navigated in an uncertain world and, as described above, the outlook is still far from being clear. And, thus, the currency has reacted accordingly. 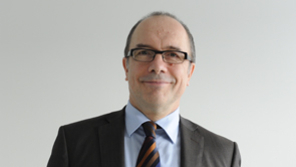 We have, in particular, identified four major (political) events that established new standards for the currency: i) the Brexit referendum itself; ii) PM Theresa May’s announcement that Brexit would be triggered “no later than March 2017”; iii) the BoE signalling it would increase its key rates; and iv) the renewed optimism on the possibility of a Brexit transition deal to be soon agreed with the EU. While the first two events took place in 2016 and heightened uncertainties about the future of the United Kingdom (the currency depreciated 17% vs. USD in 2016), the two latter events happened at the end of last year and apparently gave some “relief” to the pound – the currency gained almost 10% against the USD over the year. 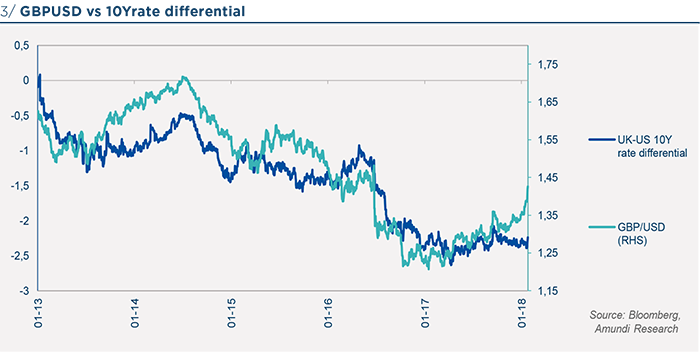 While it is true that the implied political risks have receded recently, we note that some cautiousness should be considered when making such an assessment: looking at the EUR/GBP, we observe a certain stability in the exchange rate, with a slight appreciation of the GBP being observed only recently. Hence, this means that the impressive appreciation of the GBP/USD observed by the end of 2017 is mostly attributed to US dollar weakness. It is important to note that the euro is by far the most important currency in the trade-weighted GBP followed by the Bank of England with a weight of 45.4%, whereas the weights of the US dollar and the Chinese Renminbi are respectively 18.5% and 8.7%. Currently, the 10Y interest rate would point to a lower GBP/USD. Such a disconnection from the rate differential also occurred in mid-2016, when currency and rates converged thereafter. We must stress that negotiations are only just starting and one might bear in mind that trade negotiations are quite hard to settle. Ian McCafferty, external MPC member of the BoE, stated in December 2016 that “trade negotiations traditionally are not normally concluded until ‘one second before midnight’, and the exit negotiations with the rest of the EU are unlikely to be much different. As a result, the wide range of possible outcomes means that levels of uncertainty are likely to remain elevated for a considerable period.” Hence, there is still much uncertainty and there is no scenario that can currently be ruled out, even though we believe that chances of a hard Brexit are far less likely. Such a background clearly means that the pound’s path is still very uncertain: for instance, if we take into account our most likely scenarios (scenarios 1 (quasi– EEA) and 2 (intermediate relationship with free trade in goods but only very partial passporting in financial services), see above), the perspectives for the currency can diverge dramatically. Our base case scenario (scenario 2 above) foresees an intermediate relationship, with free trade in goods but only very partial passporting in financial services (less than Switzerland). There is clearly scope for the pound to depreciate in this scenario. Indeed, if this outcome was to materialise we would expect the pound to depreciate vs. USD to 1.30 and to a larger extent vs. EUR, to around 0.95. The UK has persistently run large current account deficits over the past years, which had to be financed by capital inflows, prompting Mark Carney to declare that the UK was relying on the ‘kindness of strangers’. It is important to note that recent figures of the balance of payments have even showedthat there has been a decrease in important sources of financing, such as direct investment and portfolio investment inflows. While in a global imbalanced world such a situation is not a problem per se, running persistently large current account deficits increases the vulnerability to a sudden stop of capital inflows if market conditions deteriorate. 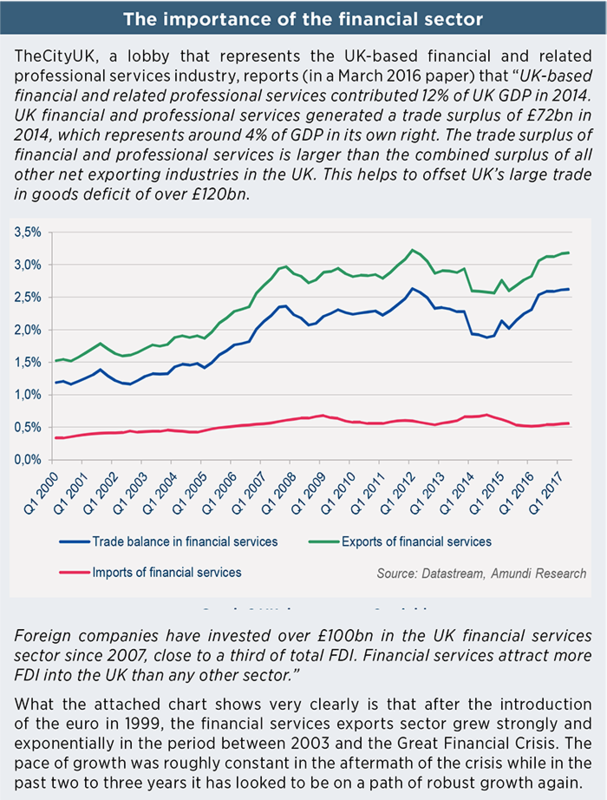 The UK’s trade surplus in financial services has largely helped to counterbalance its large trade deficit in goods, in particular when looking at the current account balance with the EU countries. Drastically restricting financial services passporting could lead to a further deterioration of the current account deficit that would harm the pound. Our second most likely scenario (scenario 1 above) is a quasi-EEA relationship, with access to the single market (only with few exceptions, including some in financial services) and only very minor restrictions on the movement of people. 25% probability”) which would definitely move in the direction of a soft Brexit, being therefore remarkably more benign than the base case. In such an outcome we would expect markets to begin re-assessing the pound according to its fundamentals, removing most of the “political” connotation the currency has had since the EU referendum in June 2016. The pound could therefore move gradually towards its fair value, which currently stands at 1.52 vs. USD (a level seen most recently in 2015). From a valuation aspect, our models show that the GBP is cheap (see fair values chart), but it is not extremely cheap: for instance, among the G10 economies, currencies with better economic fundamentals and lower imminent political risks such as the Swedish krona (SEK) and the Japanese yen (JPY) are significantly more undervalued. Moreover, looking at the current market positioning, we observe that there is scope for an unwinding of the current long positions on the GBP in the event that trade negotiations in the coming months are tough. However, an additional alternativescenario should not be ruled out for the pound, as it could materialise in the event that the UK and EU are unable to find a political agreement on the broad aspects of the future trade relationship by October 2018. Such an outcome would mean that the window for defining the broad aspects of the agreement gets extended and markets would price this in as a continuation of the status quo and therefore offer short-term support to the currency. It must be noted that in such a situation we’re not referring to a no deal scenario, but simply to one where the October 2018’s deadline is postponed and more time is allowed for the negotiations on the political agreement to be carried over. What to expect from the BoE and rates? During the World Economic Forum in Davos (23-26 January), Mark Carney, governor of the Bank of England (BoE), pointed out the that the UK is currently experiencing a “unique” situation and indicated that the more the EU-UK negotiations move forward, the clearer the view will be on the conditions of economic activity, the ideal level of exchange rates as well as the prospects on future trade costs and consequently, the effects of all of this on demand. And “all this together will determine the appropriate stance of monetary policy”. With such comments, Mr Carney has essentially highlighted one of the main messages of the BoE since the Brexit vote: developments regarding the UK’s withdrawal from the European Union have been the most significant influence on, and a source of uncertainty about, the economic outlook. But while it is true that the Brexit negotiations will determine much of the economy and certainly the course of the pound, Mr. Carney also knows he has little scope to control such an event and, still, a central bank must act. Thus, in such “exceptional circumstances” what should a central bank do? In the specific case of the BoE, recent speeches of board members can provide some hints. 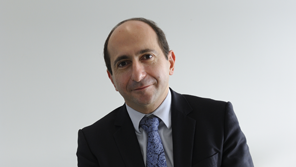 It is in particular interesting to note that Mr Jon Cunliffe and Mr Ben Broadbent, who voted, respectively, against and in favour of a Bank rate increase during the November monetary policy meeting, observe that in such an uncertain situation, the best approach is to take into account the current data as “The MPC cannot forecast what the outcome will be or how it will measure against the diverse expectations in and between households, businesses and financial markets.”1 Possibly, Mr Broadbent sums up the idea well by saying «to adapt to the football manager’s cliché, we can only play the economy that’s in front of us»2. While such views reflect personal statements of only two out of the nine board members, we find it is possible to assume that this could be a generalised view. Possibly, after having to adapt several times its perception on the implications Brexit would have on the economy (e.g. see Drut, B. and Fortes, R. 2017 “How the Bank of England sees the Brexit”), the BoE might have decided to act using the better information it now has – the current data. Indeed, this seems to have happened when the BoE signalled it would increase its interest rates during the September monetary policy meeting (it caught markets off-guard) and then, they actually made the move in November. Despite all the ongoing political uncertainties, and consequently all the future economic uncertainty, by assessing that i) inflation was high (it picked up to 3.1% in November) and that ii) “demand would keep growing at a pace just above its reduced rate of potential, generating a gradual impact in domestic inflationary pressures”, the BoE understood it had to act and increased its interest rates for the first time in ten years in the November meeting. That said, it was, however, the perceived “dovish statement” at the time that impacted the 2-year yield: the short-term yield had rallied above the base rate after a tightening cycle guideline was indicated during the September meeting, but then it was finally set lower than the current base rate again in November. Markets interpreted the BoE’s November move as being a “one and done” movement, below market expectations. It was only recently that the renewed Brexit optimism seemed to have given support for the short-term yield to move back above the base rate. However, as short-term yields are very sensitive to the BoE’s monetary policy decisions, the central bank is therefore going to be the key influence on them. And that was recent the case: by setting a more hawkish tone on the February 08 meeting and in the light of the disclosure of the new Inflation Report, the 2y yield moved up again. Regarding long-term yields, we note that they have been anchored to their US counterparts for decades, but started to de-anchor after the Brexit referendum. The UK 10Y yield has rarely been so far below the US 10Y yield. The UK 10Y yield is now in an intermediate situation between the German and the US 10Y yields. The drop of UK long-term yields is mostly linked to lower economic growth perspectives to the UK as consequence of the Brexit. In our base case scenario, UK long-term rates will gently rise but will not converge towards US yields again. 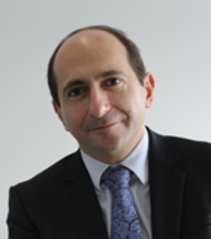 In our opinion, the BoE will still find itself in the difficult position of having to deal with an inflation scenario that we expect to remain above its target throughout 2018, and with a pace of growth in the economy that, although expected to underperform the Eurozone’s, does not show severe signs of slowdown. Although the uncertainty related to Brexit would represent a headwind for the central bank towards a tightening of financial conditions, the BoE has judged that the “steady erosion of slack over the past year or so had reduced the degree to which it was appropriate for the MPC to accommodate an extended period of inflation above the target.” Given that rates in the UK are still at very low levels, there could be an incentive to continue normalising as long as the scenario doesn’t take the direction of a hard Brexit and growth continues to remain decent. the biggest impact on the UK market will be through the pound. In this respect, the sensitivity to the two scenarios (+ or – 10% on the Cable) is only + or – 6%, lower than the usual volatility of the market (details of fair value analysis below). We don’t consider the Brexit issue as a game changer to our current position to underweight the UK vs. EMU. The IBES consensus is expecting only +7% EPS growth for 2018 and 2019 compared to +9% in the EMU, which is probably right. While the PER and the PBV relative to the MSCI World are trading lower than one standard deviation below its 10-year average, we consider that a risk premium is due because of lower potential growth and uncertainty linked to Brexit. This is not a sufficient argument to be positive on UK equities. Moreover, a greater risk than the ones considered above, casting doubt on Brexit, would strengthen the pound further and drag down UK equities. The FTSE 100 is highly sensitive to the cable swings (elasticity at -60%). Fair value modelling allows us to price in the two different scenarios for GBP: the base case for a depreciation to 1.35 and the second case for an appreciation to 1.52. 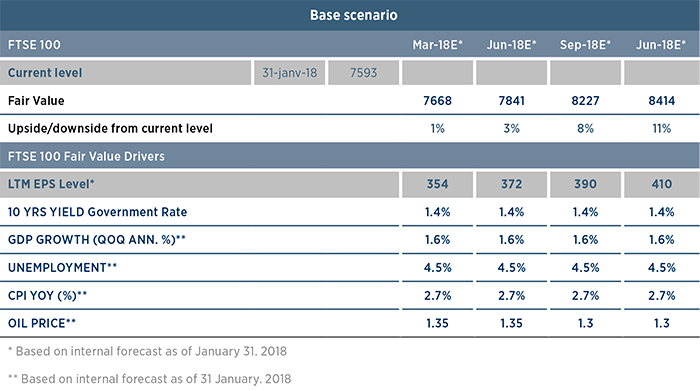 The base scenario suggests there is still upside potential as actual levels are not pricing in expectations on profits, macro picture rates and GBP. In the second most likely scenario, the overall environment and GBP appreciation would be less benign, eroding all the upside even if a more volatile but consolidating phase looks more likely than a huge correction. Those findings confirm the view that actual levels are already pricing in Brexit uncertainty and are not likely to be a game changer for the overall view so far. Complex trade deals usually take years to negotiate. The perspectives for the currency can diverge dramatically. Clearly, the balance of risks is very tilted to inflation... We expect the BoE to increase its interest rates in 2018, possibly in May.